As I work my way through the digitised Barnsley Chronicle in Barnsley Archives looking for mentions of war memorials in the post First World War years the story of the commemoration of the men of Barnsley gets more and more complex. I have already mentioned that some villages erected their memorials much quicker than others, and in some places there was a lot of discussion about the proper form of such memorials. 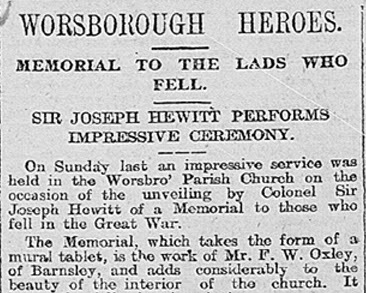 Last week I found a mention of a plaque in Worsborough Parish Church which was unveiled on 31st October 1920. I copied the cutting because it included a list of names, any list of names is like gold to a family and local historian, no matter what the context! It's the first one I have looked at this evening and it has given me a new mystery. Now it is possible that someone who attends the Worsbrough church(es) may well be able to help me out with this straight away, but getting in churches isn't the easiest thing these days so I would appreciate any help. 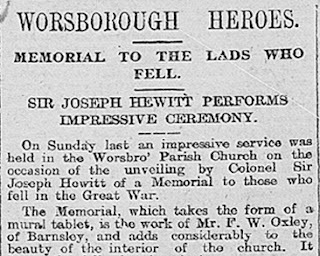 There was an extra 'o' in Worsbrough until about 50 years ago when it was officially dropped, so both spellings are right and although mostly I see Worsbro' with the apostrophe at the end in hand written sources, it also appears in this newspaper cutting. The piece mentions that the memorial is a "mural tablet" and that it's in the interior of the church. 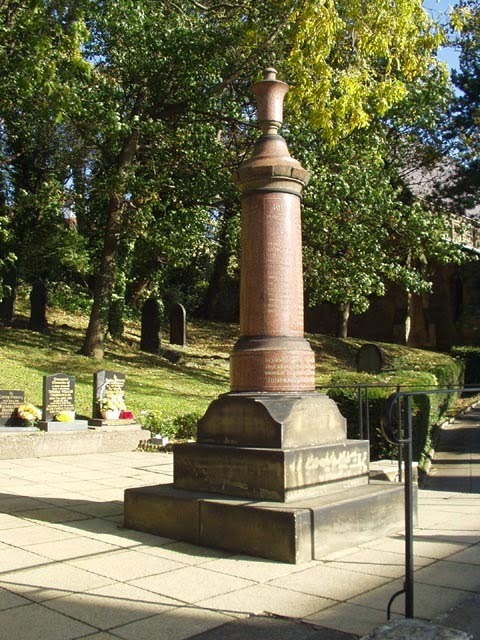 I have photos of the combined war memorial at Worsbrough St Thomas's and there is a transcription on the Worsbrough Local History Society's website. 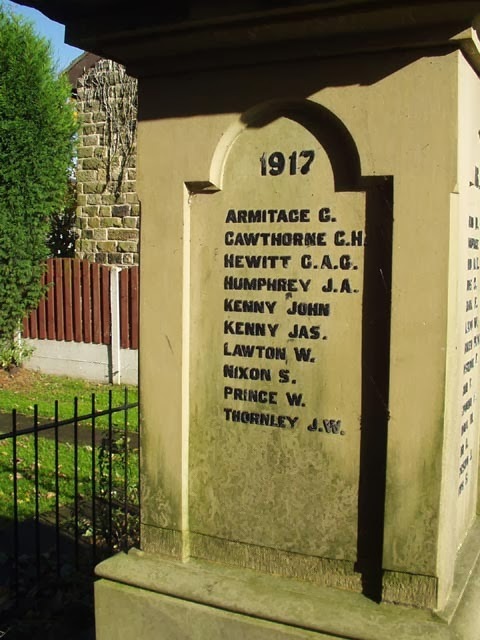 This plaque appears to be an additional memorial, erected earlier than the war memorial in the churchyard which was unveiled on 24 December 1924 according to the Worsbrough Local History Society's page. I don't have a problem with there being two memorials, although the plaque does not appear on the Imperial War Museum (IWM) War Memorial Archive, whereas there is an entry for the war memorial itself. I imagine the local people wanted to make the memorial more accessible and impressive and suitable for Remembrance Day wreath laying and so on. Maybe they received further donations after the plaque was unveiled and so decided to erect the memorial as well. Further investigations in the newspapers may help with this. No, my problem is that some of the names in the newspaper piece are of men who are not on the memorial. Given that the memorial is the later of the two I would have expected it to be the other way around, with additional names on the memorial, maybe of men who died of wounds after 1920 or whose families came forward with their names too late to be included on the plaque. There are 46 names listed in the newspaper cutting and 112 on the memorial. But only five of the names in the cutting are on the memorial! Forty-one of the names listed as being on the plaque in the church do not appear on the memorial. This is very odd. York and Lancs: Capt G A G Hewitt, Sergt G Aimer, Sergt J T Draisy, L/Cpl W Rushworth, L/Cpl W H Whitehead, Pte O Sanderson, Pte A Naylor, Pte G Weldrick, Pte J A Walton, Pte J H T Skelton, Pte W Booth, Pte L Bassender, Pte F Burkinshaw, Pte J Booth, Pte E Jackson. Duke of Wellington’s: Pte J Hargate, Pte R E Burkinshaw. 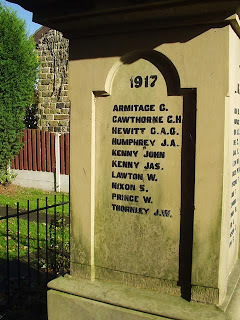 I know there are several churches in Worsbrough, so maybe these men appear on another memorial. After all the newspaper cutting doesn't actually say which church the Parish Church is. It could be St Mary's in Worsbrough Village. But if that is the case why do five of them appear on the memorial at Worsbrough Dale? I have photos of the memorial at St Luke's church in Worsbrough Common. Two of the names from the newspaper cutting are on that memorial. But that still leaves thirty-eight men somewhere else maybe? I've tried looking a couple of the names up on the Commonwealth War Graves Commission site. GW Kellett was from Birdwell and RE Burkinshaw is actually buried in St Mary's churchyard in Worsbrough. J Hayhurst is also from Birdwell as is O Sanderson - is this a pattern? Should I be looking for another memorial in Birdwell or in Worsbrough Village somewhere? Some of the names don't even appear on the CWGC. Aimer and Draisy and Bassender for example, I didn't search the whole list - have they been misspelt in the newspaper article?